Well, as we said today we’re going to deal with some thoughts on your power to succeed, the first of some discussions on the adventure of self-discovery. The major thrust of our study of truth that we’re all interested in and seriously involved in, is with the what I call, the depth within the person, the divine depths. This, as many of you know, is the major theme of my book, “Discover The Power Within You,” which in turn, is what I conceived to be the basic concept of Jesus, what he’s all about. The depth, the divine potential within the individual. And the tremendous challenge that goes along with this, is that one does not need to accept himself as he has been. That if he’s willing to break out of the shell, he can change, he can be more, he can do more. And so we say to you during this series of lessons, we want you to go with the flow. We don’t mean to go off and not come back, but we are very much interested in getting into an awareness of the flow of the creative spirit within us because this is a key to truly dynamic life and is the key to success, in the fullest sense of the word. In order to really understand any kind of greater achievement for success in life, we need to understand a little bit about what success is, what it means. There are so many interpretations. I think the average person would think of success as making a lot of money and certainly it’s a lot more than that. First of all, it’s important that we begin to take a look at ourselves in a little different way than we ever have. He hung up, started to go, thanked the druggist and the druggist was listening in on all this, as much as he could hear, and he was quite impressed with the ingenuity and industriousness of this young man and finally he said, “Say, how would you like a job in the drugstore?” The young fellow said, “Oh, you don’t understand. I don’t need a job.” “But I heard you ask that man for a job as his office boy.” And the young fellow chuckled and he said, “Well, you see, I’m really Mr. Brown’s office boy and I was just checking up on myself.” That’s one way of checking up on ourselves. I guess there are others. But, maybe in a sense, this is about all we can do today. We can’t motivate you. We can’t set you on a new path in your life and maybe we can provide a mirror by which you could take a look at yourself in a little different way. I think it was Elbert Hubbard, who said that success is the easiest thing in the world. Any person who has failed has simply put himself in opposition to the laws of the universe. It’s as simple as that, he says. And that’s very significant. Because what it indicates is that success, the success process is the continuation of the divine effort that made you in the first place. Let me say that again. The success process in you is the continuation of the divine effort that made you in the first place. Now, obviously, this begs a question of what we mean by success. Quite often a youngster will say, “I wanna be a big success in life. And as an adult, you may well ask him, “Well, that’s fine. What do you want to succeed at?” And he may say, “I don’t care, I just want to make it big.” But what is he going to make it big at? In other words, anyone can achieve success if he applies himself and if he’s willing to recognize that success process in him is a dynamic activity that is the continuation of the divine effort that made him in the first place and if he applies himself and if he continues with a consciousness of the creative flow working through him and if he is willing to believe and to have faith enough to believe that he has faith enough to do everything he wants to do and needs to do, he will go on the way to success. But obviously, first of all he has to have an idea of what it is that he wants. Some sort of a vision, what he wants to do with his life. Not what he wants to receive, but what he wants to give. How important that is. I think that maybe the greatest deficiency in the lives of so many of us is that we’ve gotten hung up on a lot of negative attitudes about ourselves. Someone tells a story of a young convict who, when he was being disrobed to fit him out with the prison garb, they discovered on his chest the tattoo, “Born to lose.” Almost as if he had created a sort of a self-fulfilling prophecy by his concept that he had tattooed on his chest, “Born to lose,” and one could almost wonder what would have happened to this young man if the tattoo had said, “Born to win.” Many of us have emblazoned upon our subconscious mind a lot of self-limiting attitudes. Many more than maybe we would like to admit to. Sometimes in our workshops and in our retreats, we challenge individuals to take some time to examine themselves, to find some of these self-limiting attitudes. Some of these feelings and clichés and statements that we unthinkingly make from time to time. For instance, I tell a little personal story about myself. Many years ago, when I was first beginning in this work, I had the attitude and it was a conviction. There was no question about it in my mind. It was an absolute reality and that was that I can’t write, period. I can’t write. Sometimes I’d get a talk at Unity Headquarters to the workers when I’d go to Unity Village and the editors would collar me afterwards and say, “Hey, that’s great! Write it up and we’ll print it in a magazine.” And I would say, “Oh, I can’t write. You’ll have to talk to somebody else. That’s not my thing.” And I had that as a self-limiting attitude that was so emblazoned on my consciousness that anytime I was even tempted to set something down on paper, I would immediately stop and say, “No, no, no, that’s not me,” almost like touching a hot stove, “I can’t write. That’s not my thing” and so I didn’t. I didn’t write anything. I couldn’t even write a letter because I can’t write. One day, I had been having lunch, as I did regularly, with a young man that I admired very much and we had a mutual fellowship. He was in the Wayne University and our office was right on the campus of Wayne University in the Maccabees Building in Detroit. So, I used to have lunch with him one day a week and we had a marvelous time conversing together and he was very challenging to me, very stimulating, but I found him to be a very refreshing young man. One day, he began to tell me that a person in my work should write and I would say the usual thing, “I can’t write.” He would say, “Well, why don’t you begin?” “Well, there’s no point in beginning when I can’t do it.” So I was arguing with him back and forth and we spent about an hour on this little argument and finally he convinced me that all you really have to do is start every day, putting something down on paper, you know, you start riding a bicycle, you start driving a car, you start playing the piano, you start punching the keys of a typewriter, somewhere you start. So, he says, “Just start working in a little diary, writing some things down every day,” and here I was talking to a youngster half my age, but he was giving me the wisdom of a person twice my age and so I agreed to do it and I told him I’d report back to him next week and next week, I was very proud to report that I’d started writing some little things down. Well, to make a long story short, I began to write, and write, and write, and write. Someone said once said that anybody can become a good writer after he’s written a million words. Well, I now have written several million words and there’s no end to it and I don’t know whether it’s great, or good, or mediocre, but the point is that the thing that happened to me was when I began to get rid of the tattoo that said, “Born to lose,” that tattoo on my consciousness that said, “Can’t write” and began to do the thing that I felt that I couldn’t do, progressively it became easier. I can remember a time when I decided I wanted to learn to type and I had started, I think it was in high school many years before. I took a typing course. I stayed about three days and I decided this is not for me. It’s too complicated. I’ll never do it and so that’s all the typing I’d ever had, but I suddenly decided that I was really handicapping myself. When I was dealing with words all the time, I needed to type and so I just decided by that time it was something that had come along with a gradual evolution of this success idea that if I want to do it, I can do it and so I didn’t go to typing school, I just took a book that told me where the keys were and I sat down for a half hour every morning and in about six weeks, I was typing 40 words a minute. Never went to a class. I don’t know how many words a minute I type now. I make an awful lot of mistakes, but I type and I spend most of my life on a typewriter. But it has helped me to realize that one can do what he desires to do if he is willing to change his self-limiting attitudes. This is the problem with most of us. Success, whatever it is, is not so much a matter of achieving something as it is overcoming that in yourself that keeps you from achieving it. Because, as we’ve said, success, the success process is the continuation of the divine effort that made you in the first place. You have it within you. Every person has it within him to succeed. Now, I’m not saying that anyone can become a great star at the Metropolitan Opera House or a great tenor standing here on Avery Fisher Hall singing and just absolutely wowing an audience with his tremendous arias or that every person can become President of a corporation or a millionaire or a Major League Baseball player, but every person has within him a uniqueness, which is the creative process manifesting as him and everyone has the power to succeed at fulfilling his own uniqueness. That’s all we need to do and that’s all we can do. One can never really do more than achieve the fulfilling of his uniqueness. But the interesting thing is, your uniqueness and my uniqueness is something as August said a little while ago, it’s a divine original. Nobody is quite like you. It’s never been duplicated, even as the fingerprints on your hand are unique and they’re your own. Your consciousness, your personality, the potentialities that are yours are unique and the problem is, we get all hung up on trying to be like somebody else or we accept the self-limitations that have been passed along to us, sometimes by teachers and well-meaning parents who called us a dunder-head and you’re not capable, you can’t do this and so forth and so we’ve allowed ourselves to create all sorts of limited blocks and these limited blocks actually keep us from fulfilling our uniqueness and every time we sit down to do anything. Sit down to play the piano, you know they laughed when I sat down to play the piano. Remember the old ad? When we sit at a typewriter, when we sit at our desk, when we go to work, when we do anything. The problem that is standing in our way is not so much that the job is difficult or that we’re in some sort of an activity we sometimes may say, over our head, the problem is that we do not know that we have a unique individualization of the divine process and that we have the potential to fulfill our uniqueness and if we fulfill our uniqueness, then we’re going to immediately be singled out as a person who is valuable. Obviously, it means being placed in a particular situation where our uniqueness can fit in, but the interesting thing is, corporations, industry, whoever the employers may be, are always looking for the person who proves outwardly that he is working toward the fulfillment of his uniqueness and that person will very quickly be put in a place where that uniqueness can be valuable. All we ever need to do is to know that we have a depth within us, that we have a pattern, that we are good enough. We are not born to lose, we’re born to win and that each of us has the potential to grow and expand and unfold, to fulfill our uniqueness and thus to achieve success. The success of fulfilling what we, ourselves, potentially can do. Now, obviously, one of the problems with the lives of many of us is that we have been put into situations that we don’t like. We have accepted jobs that we find distasteful, but which we do through the years because, after all, a man’s gotta eat, we say. You gotta make a living and so forth. And so we continue doing certain things and we find little but boredom and resistance in these experiences and we fail, thus, to ever really harness ourselves to our divine potential and we spend quite often whole lives, spinning our wheels, working throughout life at one poet says is not really life at all and this is sad. It’s a sad thing because every single person has the power within himself to achieve, to overcome, to progress, to break out of his shell, and to go on to do more and to be more, if he can break out of the self-limiting attitudes. Now this means, certainly being very careful about the things we think and the things we say. Now the point is, no one is perfect and I’m sure we’re willing to recognize that and controlling the mind and words we express takes a great deal of discipline, so we have to be patient with ourselves to a certain extent, but there’s no point in allowing these things, these thoughts, these statements to go unchallenged. And one good attitude or concept that we might take hold of in consciousness is that we should never allow ourselves to finish a negative statement. Never allow yourself to finish a negative statement. Normally, when we start expressing the negative, we know it, but we keep right on saying it anyway, almost gleefully. Never allow yourself to finish a negative statement. For instance, if you start out, “I guess the thing isn’t going to work,” you can start out saying, “I guess the thing isn’t ...” Stop yourself, go back and say, “Well, I think maybe I’d better say, I guess the thing will work out because I know that some way, I will find the guidance.” Correct the thought. Edit it. Amend it, as it were. Excuse me, I’ll go back up again. Step back a little bit and look at this statement that you’ve made as if it’s right down on the blackboard and say to yourself and say out loud, “Well, that’s a really great treatment and affirmation. I think I’ll just say it again to impress it on my mind. I’ll never be able to finish it on time. I’ll never be able to finish it on time,” and of course, you get a kind of a whimsical feeling about this and as a result of it, it impresses on your consciousness in a kind of a humorous way that it’s possible to get away from negatives. Just think now, every time you find yourself saying, “I’m gonna be late, I’m gonna be late.” Say, “Fine, that’s a great affirmation, let’s just repeat it to make it come true. I’m going to be late, I’m going to be late, I’m going to be late.” Kinda ridiculous, isn’t it? But, the interesting thing is, you see the reason we laugh at it and the reason we laugh at ourselves is because we know that it’s negative and we know that these statements have tremendous impact, tremendous negative force, yet we go around saying them anyway. How many times do you say about yourself, about your job, “The job is too much for me, I’ll never be able to do it. I don’t know why they put me into this job. They don’t pay me enough. I don’t feel that I’m appreciated. Nothing good ever happens to me around here. Everything bad happens to me. Blue Monday, da, da, da, da, da, da, da, da...” We go on with these negative statements. We know they’re negative. We know they are. We don’t need to have somebody stand back and say, “Tsk, tsk, tsk, that’s terrible.” I mean, say it to yourself. A truth student is a student who is working toward the discipline of the awareness of that which is true, right? The music student is seeking to play good notes. A drama student is trying to emote effectively and communicate beautifully and so forth. So, a truth student is involved in the practice of positive statements of truth. Why kid ourselves? Many folks spend years of their lives studying truth, which usually means reading and mouthing all sorts of metaphysical platitudes and then close the book and say, “Well, that’s lesson number one. Now I’ll get to lesson number two after I worry a while.” And you get involved in this and that and you get into all sorts of negative things and then later, as a good discipline truth student, you take your time, you open the book or you go to class and you study again all these beautiful positive metaphysical platitudes. That’s a waste of time. It’s a waste of time and I think many of us spend an awful lot of time spinning our wheels at truth because truth boils itself down very simply to dealing in consciousness with that which is true. And working to change the patterns and the attitudes that we have in mind which have been holding us back. Again, get this thought in mind of Elbert Hubbard, that success is the easiest thing in the world, that any person who has failed, who has put himself in opposition to the laws of the universe. You’ve put yourself in opposition to the laws of the universe. It doesn’t mean what other people are doing. Nobody can keep your success from you because nobody can keep you from fulfilling your uniqueness. You may say, “Well, what about the competition and what about the fact that certain people have an in with the boss and so forth?” Well, those are conditions that exist out there. That has nothing to do with your fulfilling your uniqueness. What these things may do is provide you with an excellent opportunity to be negative, if you want to be negative. If you want to grouse and complain about the favoritism in the office, then all right, go ahead and complain about favoritism, but in the process you’re going back on your commitment to deal in life and consciousness with that which is true. So, the point is, if there is favoritism in the office or if there are problems along the way or if certain people are pulling shenanigans on you and so forth and undercutting you and competing with you, as the psychiatrist might say, “That’s their problem. Your problem is what you do about it, you see.” In other words, how are you reacting to these things? How are you dealing with the consciousness that is in you with your own thoughts? Because your mind is your own, nobody else’s and success is a process that is born within your mind. It’s born as a motivation. It’s born as an idea. It’s born as a creative flow in your mind, not in anybody else’s. And if you get yourself in tune with success process and discipline yourself to eliminate the kind of self-limiting attitudes that keep you from realizing the fulfillment of your uniqueness, then you’re going to go along and achieve success. If it doesn’t come in this place, you will very easily be removed from this place into that place because nothing can keep a unique individual from expressing that uniqueness if he desires to express it in the right and perfect place. The way will open up. Nothing can keep you from success. Nothing can keep you from overwhelming fulfillment in life if you keep on the pathway of knowing yourself, discovering yourself and releasing yourself in every way, in every situation. The challenge, and it challenges you very deeply, okay this is simply another lesson. After all, when you study typing, if you do, you find yourself typing a few simple keys and then when you do that, then you begin to type three or four in succession and then you begin to use the little finger, which is very hard to do and you do all these things and you keep pushing yourself, pushing yourself, pushing yourself. If you’re studying the piano, you run scales and then you begin to do all sorts of chords and arpeggios and things that are very difficult and if you’re really serious, you keep pushing yourself to more difficult feats, because that’s what growth is all about, you see. So, in your work, even in your relationships with people, even in the management of your mind, when you find things getting more difficult, when you find that people are annoying you, when you find situations out here are just unbearable, then this, okay, you’ve passed lesson and now you’re ready for lesson two. Get into it, wade into it, always knowing, holding to this realization that the success process is the continuation of the divine effort that made you in the first place. You have the power to fulfill your uniqueness because your uniqueness is the divine possibility within you. Not in somebody else. It doesn’t mean you have to be like anybody, that you have to pattern yourself about what others have done or fill into certain niches. The important thing is you are a unique individualization of the almighty. You are God’s living enterprise. The infinite process doesn’t do things halfway and doesn’t do things by mistake. You have the power to know yourself, to find that unique pattern within you and to release it and to fulfill it and when you release and fulfill your uniqueness, you’re on the way to success. Ultimately, a success that will receive attention and acclaim, but basically a success that will be very fulfilling and very reassuring, which is really the most important thing. Now, it is certainly true that if you’re interested in bettering yourself in your position in life or just the general feeling that you’re on the right path in life, it’s so important to take a look at what you, yourself, have in mind what you feel that you would like to do. One of the ways you can do this is to ask yourself, “What would I like to be doing five years from now?” The interesting thing is most folks, when they’re involved in seeking to succeed are thinking only in terms of getting a better salary right now. What would you like to be doing with your life five years from now? Unless you can extend the length and shadow of your present activity down through the years, then really you’re not seeing clearly enough in terms of the fulfilling of that divine process within you. Many persons might say, somewhat facetiously, “Well, I’ll tell you this, five years from now I’d like to be making a lot of money.” And then, unfortunately, you have dollar signs in your eyes and anytime you function in life with dollar signs in your eyes, you obscure your vision and you frustrate the divine flow and you will not be able to fulfill the best that is in you anytime you are simply working for money. He had been thinking money. He had been working for money. Seeing every day as another day, another dollar. Seeing every job as an opportunity to make more money and he was totally blinding himself because success is not receiving, success is giving and the only way we can begin to achieve the kind of success that we dream of is where we get ourselves out of the way and decide that we’re going to think give instead of get. Most folks stumble on their get-eries. They’re so involved in trying to get, get everything, get ahead, get more money, get the better job, get the jump on the other fellow, that they’re always blinding themselves so that they cannot see properly things that can be done and so that they cannot properly project their own focus, their own divine flow and, thereby, they stand in their own shadow, stand in their own way. How important it is to become a committed giver. Now, it’s interesting. I always kind of make a joke about this, but it’s very serious because anytime a minister talks about giving people say, “Well, here comes the commercial of the church,” and everybody says, “Well, he’s not gonna get anymore out of me.” And obviously, this is not what we’re talking about. It’s unfortunate, extremely unfortunate that religion has totally perverted the idea of giving for institutionally self-interested reasons because usually when the preacher talks about giving, he’s more concerned about getting a new roof on the church. But the problem is, giving has rarely been taught adequately, basically because of self-interest. But giving is fundamental to the whole process of truth. You cannot possibly get in life without giving, you see. This is what success is all about. It’s a giving process. I’m not talking about giving money, that’s symbolical of the giving process and it’s important that we learn to give in all ways, but I’m thinking in terms of giving. There was a book a number of years ago. I think it was written by a man by the name of Dunn. I forget his first name. It was called “Try Giving Yourself Away.” He wrote a whole book about this and in this he outlined all sorts of interesting little things that a person can do. He said, “If you think give, you’re always trying to project your creativity and to get it out into expression.” In a day when everybody is trying to make a dollar out of everything they can do, his philosophy would seem somewhat Pollyanna, but I think he was very sincere at it and very successful at it. He said anytime he was in a restaurant or on a train or walking down the street, if he saw anything that he thought could be improved, he would write a letter to the city or to the corporation and tell them the idea that he thought could improve it. He was the one, for instance, that riding one day on the New York Central train between here and Chicago when they used to have the fast trains and that was the fast way of getting there, in the middle of the night, he awakened up in his Pullman berth and there was this, “Psh, psh, psh” with a train passing. He was riding what was called The Century and the other was passing The Century coming from Chicago back to New York and they were passing in the night and so he thought of the slogan, “Where the Centuries meet or where the Centuries pass,” I forget what it was. And so he wrote this to the New York Central Railroad and that became their slogan for years. I doubt if they even thanked him for it, but it didn’t matter because he was involved in a consciousness of giving himself away. And the fact is, he probably does know his job pretty well as he has done it, but does he know very well how that job could be done? What different ways in which it could be done? What different techniques, different attitudes, different methods and so forth. The chances are very likely that if he’s been on the job 25 years, 24 years and six months ago he stopped trying anything new and so he’s simply coasted the rest of the way and he may have had all sorts of feelings of resistance, “Why don’t they promote me? Why don’t they appreciate me more around here? I do my job. I come to work. I work hard all day.” Fine, that’s great and they pay him for it, but the fact is, long since he has forgotten the idea of giving. I say that every person, not strictly for the benefit of the corporation and that’s a very important thing, but for his own self-interest in terms of keeping his own mind healthy, should never set down to do any job, but when he takes one moment. Certainly if a person is dedicated as a true student, he’d take a moment to prepare himself spiritually to get himself into the creative flow and then take one moment to take a look at the job, sort of objectively, and say, “Now I wonder if there is a better way to do this than I’ve ever done it before?” And the interesting thing is, all great innovations that lead to overwhelming successes in other lives that we read stories about started when somebody decided there must be a better way. I don’t mean the better way in saving in a particular bank, but a better way to do a particular thing. A better way to follow a particular pathway to create a product or whatever, to somehow change the pattern, be willing to grow and change. Are you willing to grow and change? Many of us want to progress, but we want things to progress in terms of, they’re all coming to us. Progression means unfoldment. It means being different, being more. When was the last time that you sat down at the beginning of the day and say, “Now, I know how I’ve always functioned in this office. I know how I’ve related to people, but I’m a growth creature and I can be more. Now this day, how can I be more and do more and give more than I’ve ever done before?” When was the last time you did that? Well, I’m sure many of you do this quite often. Probably as good truth students, most of you do it every day. Maybe you stop three or four times a day and tell yourself, “Now, look, I’ve got to do a little more. I’ve got to progress. I’ve got to give more.” Well, if you do, fine. Tell the other people how you do it. The fact is, that most of us very easily get set into ruts and we don’t really follow that pathway anymore. Success is the continuation of the divine effort that made you in the first place and if you are not succeeding and you have to decide for yourself, you have to ask yourself, “Do I call myself a success? Have I really gone as far in life as I think that I really would like to be or dream of becoming? Have I done as much in my job as I always wished that I could? Have I achieved the kind of position? Have I expressed the kind of creativity that I always felt that somehow I would like to do? If I haven’t, then what’s the reason?” Again, Elbert Hubbard’s thought, “Success is the easiest thing in the world. He who is not succeeding is somehow standing in the way of the principles of the universe.” So the question is then, how am I blocking the force or the flow of the universe? How am I standing in my own way. And if one is really careful and looks at himself very, very analytically, he will begin to find answers. Some of them are very painful. Some of them are very difficult to look at. Because we will find, in most cases, and we dealt with this yesterday in our workshop and if you find a little huskiness in my voice, it’s because I talked for six hours yesterday, but in our workshop we were talking a little bit about a thing that we talked some weeks ago in our prayer workshops relative to the idea of working up a little what I call an autobiography diary, where you ask yourself the question, if you do not believe that you are as successful as you would like to be, you ask the question, “Why am I not a success?” Or, “Why have I not done as well in this job as I feel that I should do?” And so you write it across the top of the page and then you analyze this thing, think very deeply about it until you come up with some constructive answers and, obviously, first of all you will find it’s very difficult because you’ll say, “If I knew why, then I’d be doing differently.” That isn’t exactly true because that isn’t the way consciousness normally works. Normally, we know why, but we don’t do it because we’re too hung up in alibis. And the alibis we have dozens of. And I say if you keep asking this question, you’ll come up with these alibis. I’m not as successful in this job as I would like to be because I’ve long since found out that it’s not what you know around here, but it’s who you know and I don’t know the right people. That’s your alibi. Have you ever had that kind of an alibi? I’m not as successful as I’d like in this job because they expect an education and I wasn’t able to go to college because I had to get out of school and take care of my family, etc., etc., etc. Another alibi. How many alibis can you think for the reasons why you’re not successful in any given job? Why you don’t make the kind of money that you’d like to make? Why you haven’t gone as far as you’d like to go? How many alibis can you come up with? Chances are very likely you will find dozens of them and it’s exciting. It’s exciting because these are all states of consciousness that are coming right out of you. You’re not dreaming them up. They’re coming out of your own mind. Every single one of them, whether you know it or not, has been emblazoned upon your consciousness like the tattoo, “Born to lose. No hope for me because there’s favoritism in the office” and you’ve carried that around with you every day you’ve gone to work it’s been in your consciousness. Or as they used to say, stuck in your craw and it’s there and if you stop to think about it, your blood boils, you get upset and so forth. Every one of these has been the reason why you have failed to progress in the fulfilling of your own uniqueness and when you understand this and you understand that the success process is the continuation of the divine effort that made you in the first place, then success is an inner drive to fulfill this uniqueness and nothing can stop it except you. Nothing can stop it. Anything can give you the opportunity to find alibis and thus to give up and in a way, this is what we have often done. We’ve simply separated the situation, the real from the unreal. We’ve stood in our own way. We’ve come up with a lot of limited attitudes, instead of plunging ahead, fulfilling our own uniqueness in spite of what others are doing and saying, we’ve come up with an alibi that has given us a healthy rationalization to just settle back and say, “Well, after all, I do my work and what more can you expect? A guy can only do what he can do.” And so, at that point, you’ve settled into your own rut and you have nobody to blame but yourself. So, I would say, if you have a desire for greater success in life and I don’t care what your particular field is, what is it that you’re trying to do, what job you have, it doesn’t make any difference. If you have a desire to make more out of your life, to be more, to do more, to have more, then I say, stop looking at the world around you. Stop making excuses for yourself on the basis of what they do and they say on the basis of the economy, on the basis of the attitudes your parents had towards you, on the basis of whether you had or did not have a proper education. Stop excusing yourself. Right now, today, the success process is the continuation of the divine effort that made you in the first place. You have today, the same potential uniqueness that you had when you were a youngster, when people used to pat you on the head and say, “Oh, this little boy will go far,” or “This little girl has great potentialities.” You have the same potentiality within you today. It’s never changed, anymore than the pattern of your fingerprint has changed. You have that possibility within you. The difference is, early along, maybe you had stars in your eyes, but then eventually you got gold dollars in your eyes and eventually allowed yourself to tattoo yourself with all sorts of limited attitudes and thus to bog yourself down with all sorts of attitudes of defeat and self-pity and remorse and discouragement. But you can change. That’s what truth is all about. That’s the exciting part. It’s not a case of wouldn’t it be wonderful if? So often people say, if I had known this teaching 30 years ago. Let’s be realistic. 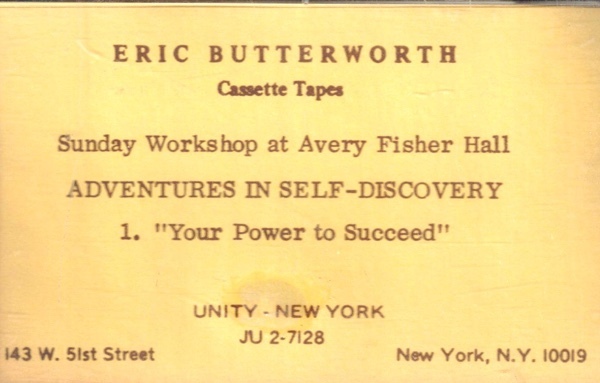 If you had known this teaching 30 years ago, if you had known Eric Butterworth 30 years ago, you probably would’ve said, “What a queer duck.” You would’ve had nothing to do with it. The teaching was around in those days. There were plenty of fine teachers around in those days. The truth was there. Truth is eternal. The fact is, if you could go back 30 years, you probably would do the same thing you’ve done. It’s like quite often people give advice to someone else. This is the real delight to me is someone will say, “If I were you, I would do so and so.” That’s about as ridiculous a statement as you can make because if I were you, I would still be me and I’d be doing the way I do it, right? There’s no question about it. Usually we try to put it on somebody else. We haven’t done it, but if I were you, I’d do it, you see? The point is, right now today, you are you. Right now, today, you are a unique individualization of the divine process. Right now, today, you have that success spark within you. I don’t care what your particular work, your employment, your activities in life. Right now, today, you have that divine spark at the heart and root of you. Right now, today, you can begin to change. You say, “But there’s so much. You know, I’m so deeply embedded in this terrible morass of self defeat.” Okay, but you can begin to change. You can begin to change. Like I was telling ... I don’t usually tell stories about myself, but when I talk about writing, I began to write a little bit at a time, haltingly, inefficiently, inaccurately, but I began. And this is the way every person has ever started. As the Poet Goethe says, “Only begin it and the mind grows heated. Begin and the work will be completed.” Start it and you begin to make the slightest little change. Correct the slightest little defect in consciousness, in terms of the self-limitations that you imposed upon yourself and you begin to progress. And a very good illustration of this, I think, for those of you who may be sport-minded, we just recently concluded a World Series that a lot of people were involved in, is thinking about baseball players. The baseball player is involved, as all of us are involved, in overcoming his own self-limiting attitudes in order to succeed in what he does. Any kind of athletic activity involves almost tremendously, almost more than in any other sense in terms of attitudes, in terms of consciousness, in terms of the psychology involved. And just imagine now, a Major League Baseball player is always concerned about his batting average, if he happens to be a fielder and batter, and note the difference between a Major League Baseball player who bats .300 and if you’re not sports minded, then no point in defining that. If you are, then you know what it is. If he bats .300, you know that he’s either there or he’s on the way to super-stardom, but if he bats .200, he’s on his way back to the Minors and he’s not worth very much. The difference between .200 and .300 is one extra hit in every 10 times at bat. A tenth percent differential and in that case, 10% means the difference between being able to go on the block and pick up a contract for maybe $2.5 million as they’re doing today and he goes back to the Minor Leagues where he’s lucky if he makes $10,000 a year. The difference, a 10% differential. Now, I don’t know if this is exactly the same in life, but I suspect it is, because we tend to exaggerate the difference between success and achievement in the person who almost makes it. It may be very slight. Now the question that one needs to ask himself, “Can I increase my performance by 10%, just 10%?” Spend a little more time. I’m not talking about working 10% longer, that’s not the point. You can work hours and hours and hours and work in a sense of self-defeat and it isn’t going to make any difference. Success doesn’t mean the person who has calluses on his hands because there’s an awful lot of people with calluses on their hands that never get anywhere in life. That’s not the point. The 10% differential in terms of the way in which you discipline yourself. The way in which you carefully control your thoughts. Just 10% more. You stop in the middle of your sentence and say, “I’m not going to say that because that’s negative.” Or you stop yourself after you’ve said a negative statement and said, “If I take another step, I just think I’ll surely die” and then you stand back and say, “Okay, that’s a great affirmation, let’s say it. I think I will surely die, I think I will surely die.” How many times can you say that? In other words, I’m saying that if you increase your performance as a student of truth, doing the thing, not talking about it, not sitting listening to it, not mouthing platitudes, but doing the thing, 10% more. Do you feel that you can do 10% more, that you can give 10% more to your meditation, to your study, to the concentration on spiritual ideas, to the work of disciplining your own consciousness, just 10% difference? That’s not very much, 10%. And I suspect that the parallel would run true, that whereas on one level you may be in your own self-image an [inaudible 00:49:33], you’re not quite making it. You have settled into a sort of a healthy mediocrity, where you’re more concerned with Social Security retirement benefits than you are really getting ahead. Ten percent to put you up to that area where suddenly you become important, you’re needed, your in demand and there are those who are coming to you to say, “Hey, I like the way you do things. I would like you to do this job for me.” Just a 10% difference. I suspect that that’s more true that we would admit. That’s one of the big alibis that most of us have. “If I had done this then, it would’ve been fine, but it’s too late now. I’m too old.” We all have desires to improve ourselves, to take an educational course or do something, but always there’s this thought, “Well, I’m too old for that.” You say, “I don’t think I could learn anymore.” As a matter of fact, there’s some tests that were made up at Columbia University a few years ago that I think are very exciting, talking about the ability, the potential of individuals to learn and to concentrate and they took a group of people, a controlled group all the way from teenagers in their early teens, up to octogenarians and they exposed them to all sorts of learning processes which included such difficult subjects as shorthand and the study of the Russian language, which I’m told are two of the most difficult studies you can make. I love the story of the man, who I think was 98 years old and he subscribed to a set of the New Encyclopedia Britannica and he said, “There’s so much that I have yet to learn” and I think that’s beautiful and delightful because he probably was figuring out a self-improvement course that was going to take him another 10 or 15 years to read through the Encyclopedia Britannica and he’s 98 years old. And why should we laugh at that? You know, because what’s the difference? At the end of reading it 10 or 15 years, he’d be too old, but how old will he be if he doesn’t read it? And how much different will his consciousness be? How more alive and vital will he be? So I say, if you find that little alibi emblazoned on your chest, “Too old to progress,” then begin to get rid of it and change that and say, “I am as old as God and as young as the morning. I am. I am as old as God and as young as the morning and I can do what I want to do and I’m going to start in tomorrow morning. Maybe not tomorrow morning, start in right now. But tomorrow often leads to a lot of procrastination. However, this is what we have in mind when we talk about the power to succeed. We’re not simply giving a success motivation course for young people who are starting out in life. We’re talking to every single person who’s involved in the study of truth. You can achieve. You can overcome. You can break out of your shell. You can begin to do more and to be more. Why? Because you are more. That’s what truth is all about. Truth deals with your divine potential, your individual uniqueness and you have a uniqueness within you. It may have been a long time since you’ve thought of yourself in that way, but today is the day to begin this program of self-discovery. In the weeks to come, we’re going to talk about your power to be healed and your power to overcome and a lot of other things, all in the same vein. All to challenge you to begin to release your own individual uniqueness and to begin to become what you can be because what you can be, you are. That’s the truth about you and praise God for that. Thank you very much.